Does this ever happen to you? You have a little seed of an idea. You start working on your little idea and it kind of takes on a life of its own. That's what happened with this quilt. 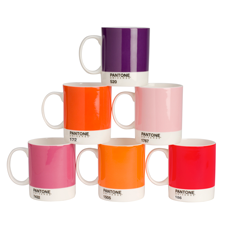 It probably all started when I decided I loved all things Pantone. 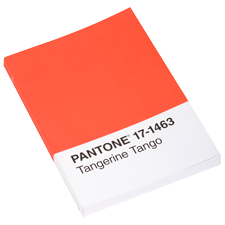 I love their simple, yet iconic, block of color with the name of the color. Then at spring quilt market in May, thanks to Robert Kaufman, I ended up with not only the brand new Kona color card, but a charm pack with all the new Kona colors. 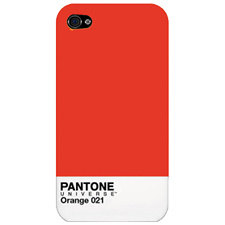 And then the two things, Kona cottons and Pantone, kind of did a mash-up in my head. And a couple of weeks ago I finished "One in Every (Kona) Color." The first people to see the completed quilt were the fabulous people at Robert Kaufman. And currently, in my sewing room, my camera is on a tripod and I'm waiting for good light to take better pictures. But I couldn't wait to share it now that it is officially completed! This is essentially my re-creation of the Kona color card. I have every single color of Kona cotton, and, in Pantone style, the name of the color and the manufacturer's number. I love this quilt! It was fun to make, although it required a weekend where I spent hours printing out the names of the colors onto printer-friendly fabric (I'll be doing a review of my thoughts on Friday), checking and double checking to make sure the names were matched with the proper colors and that there were no typos. On Friday, I'll be posting progress photos and some close-ups. Along with that, I'll be giving away my scraps from this quilt, which basically involve a 1-inch by 5-inch strip of every single color of Kona cotton. I hope you will come back here on Friday. In other news, I have also been working on My Granny is Amish. I ended up quilting it with no. 8 perle cotton using my sewing machine! And I think this black fabric has grabbed every single piece of lint in a two-mile radius! oh wow - your KONA quilt is something else! Can't wait to hear more about it. So creative! Holy crap. That is a completely fabulous quilt, Cindy! I will be back on Friday hoping to win your scraps! Every colour! I'm jealous! You won't need that card anymore, will you? Oh, I suppose the quilt will be too big to take fabric shopping!! It's incredible! I'm with Lee- this MUST be put on display @ Quilt Market! Wow! Absolutely stunning and gorgeous quilt! Oh and much less chance of it disappearing in the sewing room than a colour card - how handy to match new fabrics now heheh! Cindy, that is the most amazing quilt! What a superb idea and amazing execution! 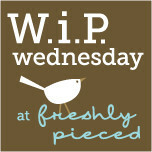 I love reading your blog and i shall definitely be back on Friday! Your "one in Every (Kona) Colour" is such a standout quilt....fun and vibrant. This is amazing! What a great idea. And now you have a decent size sample of each colour too! WOW!!! That Kona Quilt is amazing!!! Wow wow wow Cindy!!! Your Kona quilt is such a wonderful idea and you have executed it perfectly! Will be curious to hear more about it. What a great idea to make a kona color card sampler. It looks fabulous. I think this has been said, but WOW! The Kona quilt is so fun and would be an amusing read while you're curled up on the couch! Wow! Love that Kona color card quilt! And so much easier to use than the color card! It's incredible and I can't wait for the close-ups! I also love your Amish granny - did you put the perle in the bobbin and work upside down or was it okay as the top thread? Oh wow, that quilt is amazing, and printing out all the names too?! I bow to your inventiveness and attention to detail! It's fabulous. Your very own oversized Kona colour chart! Oh my! How clever are you to make a color card of Kona cottons! I love it and Kona too! Fantastic! 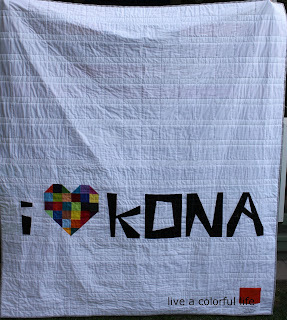 Your KONA quilt is so awesome!!! Looking forward to the close up photos. I am also loving your quilting on the granny quilt. So clever to use perle cotton. Are there any tricks/tips for doing that? Cindy, I'm so happy to finally see your Kona Quilt. Awesome job, girlfriend....quilted and bound too!! Woo HOO! I so like your Amish Granny squares, too....wondering what you used on the bobbin to do the quilting. Oh, wow! What a great idea and great execution. Now the only thing we need is for Robert Kaufman to work with you to sell a kit with all the colors and the text printed so the rest of us can make a quilt like this. Absolutely love it! O.M.G. 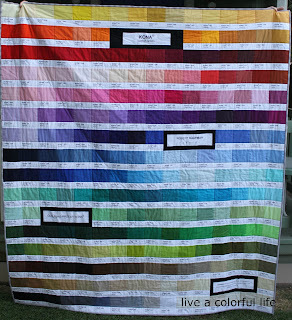 Your Kona/Pantone quilt is the most fabulous quilt I have ever seen! I don't have the proper vocabulary to describe my feelings for this quilt. 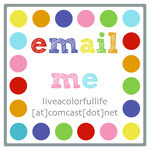 I may just have to pull up this post randomly and stare at that colorful goodness. The Kona Quilt is awesome. Robert Kauffman should buy that from you for advertising! Then again, maybe you don't want to give it up. I love the Moda quilt!!!!! That is awesome and your granny looks fabulous too. Your kona quilt blows my mind! Awesome job! Your color quilt is so much more fun than you described it. How fun to recreate Kona's color card with their fabrics. I do love working with printer-friendly fabrics, and have even used them for a few graphic design projects, so I'm curious to hear what you think of them. I adore your Kona quilt!! That is just amazing. I just LOVE the Kona quilt!! I can see a lot of people wanting to copy that idea. The grannies are also gorgeous. You are a rock star! A quiltmaking genius! That Kona quilt is amazing. Way to go, Cindy! You KONA quilt is AMAZING!! That is truly creative and crisp! 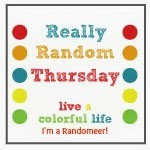 I just made a post about someone sending a rainbow my way for inspiration and I totally got my wish.. thanks for sharing! Un...be...lievable! You never cease to amaze me!! 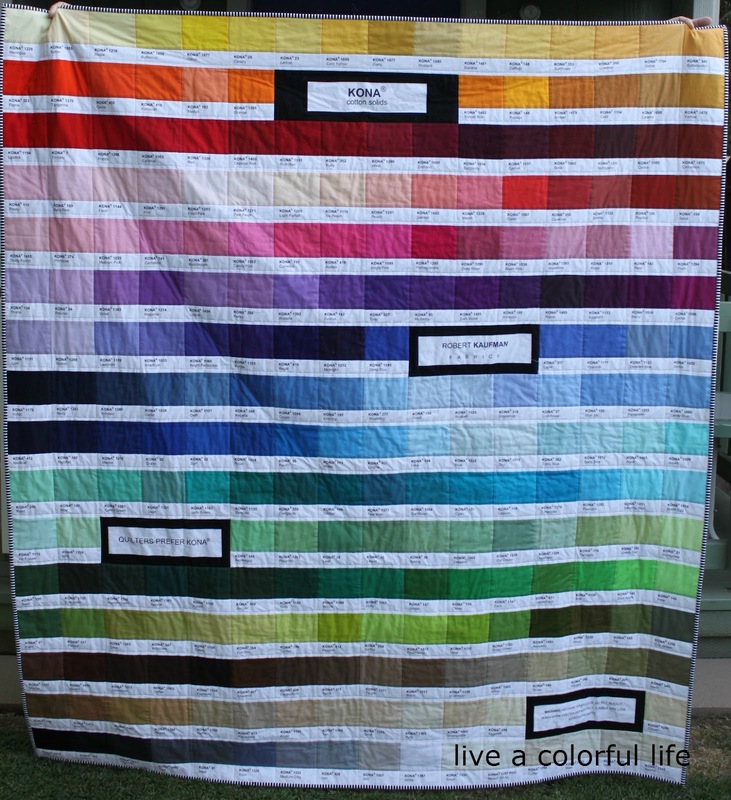 Omg, your Kona-meets-Pantone quilt is amazing. Love, love, love love it. Your Kona quilt is absolutely gorgeous! The back is perfect too, love that patchwork heart! The Kona quilt is to die for! PLEASE PLEASE PLEASE post lots of photos soon. I'm going to add to the voices saying how amazing your Kona quilt is. What an incredible project! You must live more than two miles from me, because my quilts pick up every bit of lint within a 2-mile radius, too! Your Kona quilt is fabulous. I can't wait to read more about it. 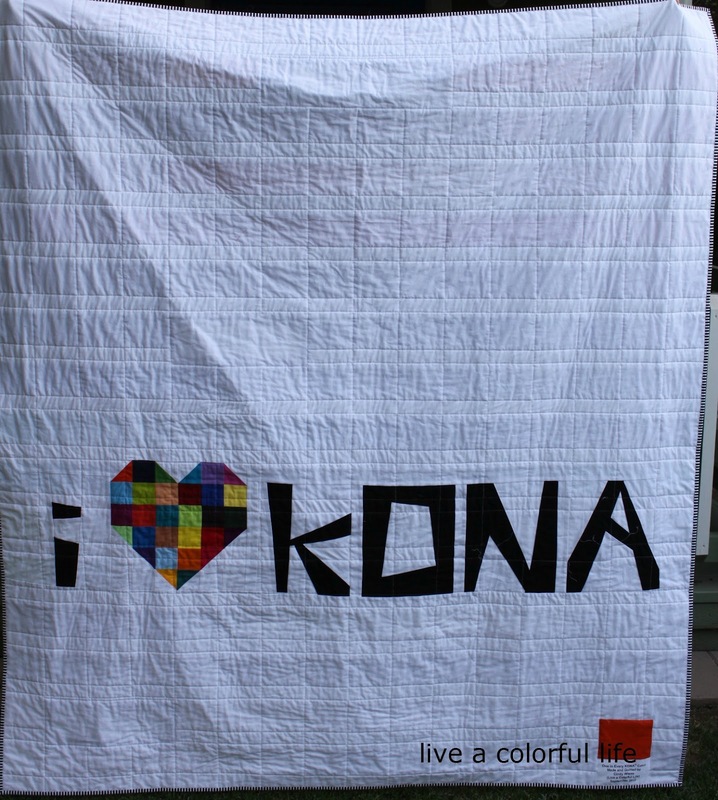 LOVE your Kona quilt! I missed it till today! Yikes! Oh, I can only imagine how much you poured over it looking for typos. That would have made me crazy. It's awesome. I love the Colourcard quilt and the Amish squares are just lovely! The colours sparkle. Everything is amazing. I love the Kona color quilt. LOVE! And your granny one is great, too. 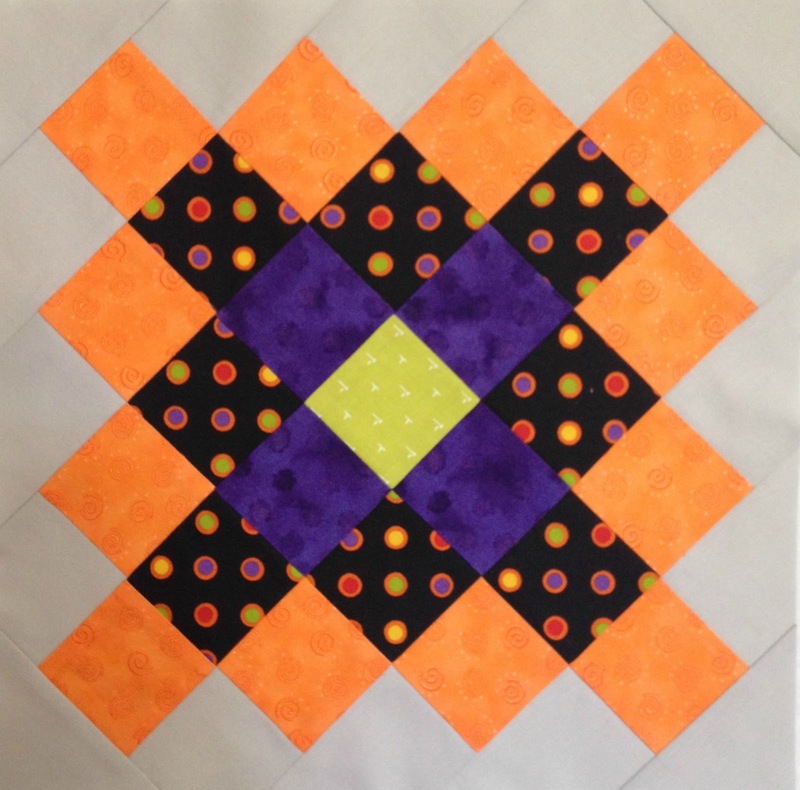 I can't wait for the review of the printable fabric and for you discussion of quilting with the perle cotton. You're a tease. I want more! Wow, that is so fantastic quilt! Your idea and desing is perfect! Your Kona quilt is just amazing! What a fantastic idea! I'd say Kona must love you! It's a great quilt and surely bound for fame. How did it go with the perle in your machine? Any special tricks because I'd like to try it. You are seriously incredible!! That Kona quilt is beyond brilliant!! This is amazing, Cindy!! I still can't get over it. And yes, I hope Kaufman displays it at Market! I'm sitting here with my mouth open wide! That Kona quilt is AMAZING! Fabulous quilt and great idea!!! I love that quilt! If only someone sold a kit for it, I'd be there!